Agia Anna is an excellent place to spend your vacation on Naxos Island. It offers the perfect atmosphere and environment for leisure and sand, sea & sun resting with lots of alternatives. SEA & SUN: Sun beds & umbrellas along the coast, some of them run by restaurants or cafes so you may have a drink or a snack on the beach. The sea is also perfect for snorkeling. GASTRONOMY: In Agia Anna there are some of the very best restaurants on Naxos Island. Most of them are on or, next to the beach offering beautiful views. CLUBBING: There are beach clubs and beach bars in Agia Anna, and some of them organize beach parties. Don't miss it. HORSE RIDING: Tours on horseback around Agia Anna, Agios Arsenios, Mikri Vigla and the beaches on the south west coast are available. DAY CRUISES: Many undiscovered places are waiting for you to be discovered. Naxos southern beaches, neighbour islands (Koufonisia, Iraklia, Schinousa) are here for you. Departures are from Agia Anna small pier. LOCAL FESTIVALS: Potato Festival (beginning of August). Naxos is well known for the quality and taste of its potatoes. 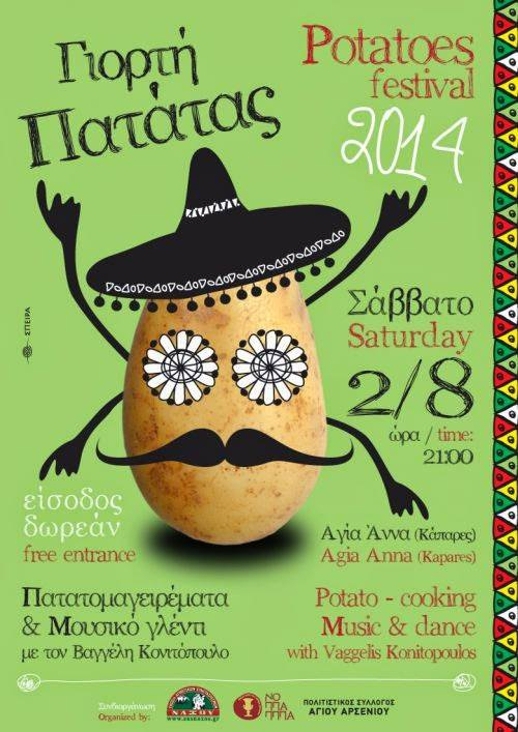 Each year, the Union of Agricultural Cooperatives of Naxos organizes the Naxos Potato Festival. At the the chefs will present potato-based dishes. Entertainment in traditional island style will be provided by popular musical groups. EXPLORE THE ISLAND: Agia Anna is located between Agios Prokopios and Plaka beaches. 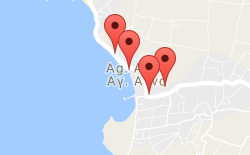 The main road passes through Agia Anna the resort with the south west beaches (Mikri Vigla, Kastraki, Pyrgaki) and the island's villages (Sagri, Halki, Filoti etc), so Agia Anna is the iseal starting point to discover Naxos' beauties. It can be easily reached from Naxos Town (Hora) and offers a stunning beach, a great choice of accommodation, clubbing and restaurants. It is only a short walk away from Agios Prokopios and Plaka beaches.